This Green Onion Soup is a twist on classic French Onion Soup–but it’s much quicker to make! Enjoy it for a light meal or a first course. It’s especially delicious when you can use fresh green onions, in season in the spring and summer! Onions are a shadowy part of my past, and find little acceptance in my present. But strangely enough, these odd bulbs have managed to charm my taste buds in two notable forms. 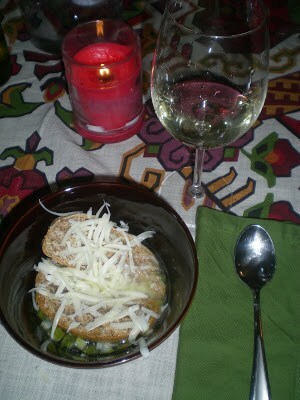 The first is French onion soup, which I selected off of a menu in France (the one governed by Epcot) when I was a child. I still marvel at that choice, but have a suspicion that I was heavily influenced by the melted cheese that came on top. Anyway, I liked it. The second form of onion that I enjoy is green onions. They lack the things I loathe about regular onions, and impart a mild and complimentary flavour to all manner of dishes. The idea grew in my head to create a recipe that would epitomize my acceptance of onions. Green onion soup is a take on its French cousin, but you will find it more savoury rather than sweet. I made this with homemade beef stock and homemade sourdough bread, which you would need to plan ahead for, but other than that this soup is deliciously easy to make. This Green Onion Soup is a twist on classic French Onion Soup--but it's much quicker to make! Enjoy it for a light meal or a first course. Melt the butter in a pot. Use scissors to cut up the onions--bulbs and stalks--over the pot. Add garlic to the pot. Simmer with the onions for 5 minutes. Add beef broth, water, pepper, bay leaf, and several pinches of salt. Heat and simmer for a few minutes. Add wine. Toast sourdough bread. Dish up soup; float one or two pieces of bread over each serving. Grate a pile of Swiss cheese over each. If you don't have sourdough, use any bread that is crusty or dense and will stand up well to the broth. You can buy grass-fed, organic beef broth online to make this soup very nutritious! 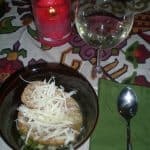 I would never have thought of green onion soup, but it sounds good, particularly with the addition of cheese. I’m going to be hosting a blog carnival specifically for soups, stocks and chowders, starting this Sunday. I would love it if you would come over and post this recipe. Here’s a link with more info.